Looking for a convenient and FREE way to complete your CLE requirements? 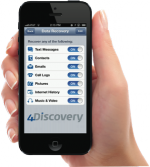 Concerned about compliance with rapidly-changing eDiscovery technology? Want to have lunch and network with colleagues while earning CLE credits? 4Discovery brings CLE programs to the Western Suburbs! 1.5 billion new Smart Phones will be sold in the next five years. These phones and other mobile devices can leave behind an indisputable digital trail, and the Electronically Stored Information (ESI) stored on them can often be relevant, unique, and discoverable. Many employees freely admit to sending confidential company information over their mobile device. Is this important new source of ESI a part of your eDiscovery/investigative strategy? • How can you discover/collect this evidence? • BYOD (”Bring Your Own Device”) work issues. • Text messages: The next big ESI Frontier. • How GPS data creates a compelling time-line. • Why authentication is so critical.